It’s been months since I played Rocket League, a game about cars playing soccer. The game’s newest game mode switches sports, and it’s really fun! My Rocket League addiction was deep for a few months in 2015. Though I was never particularly good, it was the kind of game I could play while waiting for a cab to show up. Friends would come over and we’d pass the controller around, beers strewn about over the table, and we’d mock each other endlessly. Every goal seems easy when you’re not playing. As with most games, I eventually moved onto the next thing, but Rocket League’s popularity has continued, thanks to a dedicated community and expansion onto platforms like Xbox One. This has allowed the developer to keep adding more and more to Rocket League, while leaving the core intact. Hoops, a basketball-themed mode, is one of the biggest additions yet, and requires players to use their cars in some fundamentally different ways. Matches open differently than before, with the ball shooting into the air, as they do at the start of real basketball games. 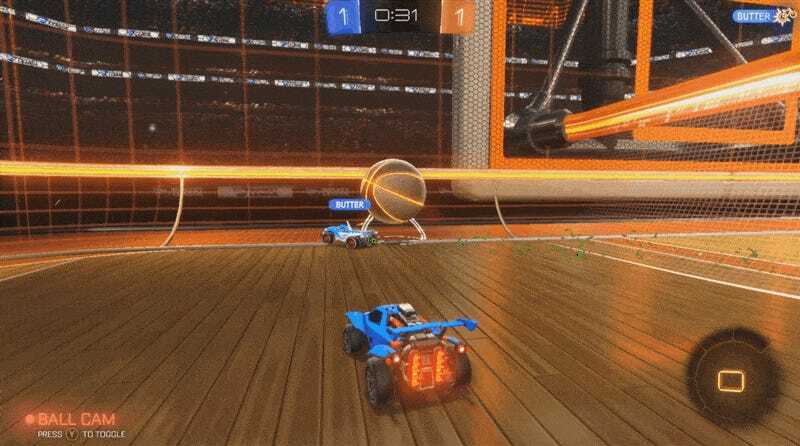 In typical Rocket League matches, players rush to hit the ball head-on. Now, you’re forced to shoot into the air if you want any chance at having early control over the ball. It’s high risk, high reward. In a few matches, players could immediately tip the ball right into the hoop. More often, however, the ball went sailing in a random direction, and patient players were able to take advantage. No matter what, you’ll need to learn how to boost your car into the air. Hoops is all about tipping the ball to create “shots,” and you’re going to have a way better chance of pulling that off if you can launch yourself. The hoop extends up from the ground, but your cars sail right through the virtual net. The ball does not, and if timed right, can roll right up. There’s even a reason to try and shoot the ball into the ceiling now. It’s hard to say whether hoops will prove more than a gimmick, but at this stage in Rocket League’s life, that’s probably okay. It got me to boot up the game and think about playing again. It’s only five minutes! Why not?